By any measure, Taoiseach Varadkar’s Northern Ireland visit was a success. It combined style with a big dollop of substance. You had the optics of his attendance at the Belfast Pride breakfast and the substance of his key note address at Queen’s University in which he set out a clear and thoughtful approach to Brexit, the Irish/Irish border and the future of Northern Ireland. Most importantly it linked all three. I spoke with a few people who were in the room for his speech and they each said that the “buzz” was palpable. This, they each reported, was something new, different and exciting. Each liked the speech, feeling it hit the right buttons, while not sounding too preachy. With one short visit Varadkar appears to have binned the Fianna Fáil leader’s narrative that the Irish government does not pay sufficient attention to Northern Ireland and gazumped Sinn Féin on its spurious claim to be the only one thinking about unity. But appearances can be deceptive. Despite the visit, Micheál Martin is still right, it is just that he will find it tougher to make that claim stick after last week. Silly and ill-considered solo-run interventions like last week’s one from Fianna Fáil’s Brexit spokesperson, Stephen Donnelly, do not help Martin. If Donnelly is going to grab the ball, then it is a good idea to plant it in the back of the other sides goal and not to dribble it towards your own goal line. 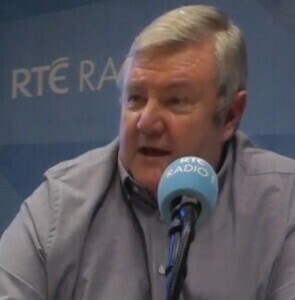 What the Taoiseach has said on the Border is not, contrary to what Deputy Donnelly may think, “reckless” nor “dangerous”, but neither is it grounds to canonise Leo – let us look at what has happened and try to decode some specific actions and see what is really going on. First is Leo’s tough talk on Brexit and the border. It started at An Taoiseach’s press briefing preceding his Belfast trip. 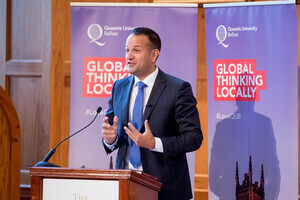 His tough talk came in response to the front-page story in the previous day’s London Times quoting Coveney as saying that Ireland was not interested in a technological solution to the border. The Times treated his remarks as something new, even though Coveney had said it all that two week earlier to journalists in Brussels. In fact, all Coveney was doing was repeating verbatim what Taoiseach Enda Kenny had said in a keynote speech to the IIEA in February. Coveney made the running on this issue, not Varadkar. Indeed An Taoiseach was playing catch up hence his more robust language in restating what his erstwhile rival had said and what has been the Irish governments position for almost a year. “It’s up to them to say what it is, say how it would work and first of all convince their own people, their own voters that this is actually a good idea. They may not be the most diplomatic, but neither are they in the realms of gunboat diplomacy. Indeed, it can be argued that Dublin needed to remove some of the coding from its public language so that people could hear what it has been saying. So, in attempting to catch up with his own Foreign Minister Varadkar has, inadvertently and accidentally, found a route to potentially steal a key issue away from Fianna Fáil and make it his own. Suddenly, Varadkar is speaking to republicanism and nationalism, North and South in clear and ringing tones in a way that his predecessor failed to do. 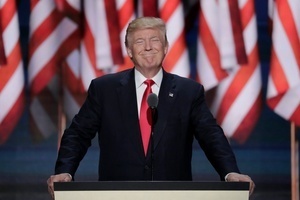 The fact that he is not doing it out of conviction or out of some deep-seated belief is irrelevant, for now, but may come back to the surface in the coming months when the depth and heft of his newly found nationalism is tested. In the meantime, the question can legitimately be asked, why didn’t we see this tough and bold Varadkar in Downing Street a few weeks earlier? Why wasn’t he saying this to Prime Minister May rather than whimpering on about Love Actually? The other element to decode in this scenario is style. The new Taoiseach used the Queen’s University speech and the Vincent Browe interview to underscore the major differences between him and Enda Kenny. Not only did Varadkar give a speech at Queen’s, he also agreed to take questions from the audience, something that his predecessor was famously loathe to do. As for the Vincent Browne interview, the only real news about it was that he had done it at all. Again, a gentle reminder that we are expected to see Leo as a stark contrast to his predecessor; who resolutely refused to appear with that man Browne. But contrary to what the Taoiseach’s expanded cohort of convincers may have us believe, the style may not be so very different after all. As we all waxed lyrical about Varadkar’s triumph in Belfast the latest set of homeless stats that show how the government’s policy is failing badly were sneaked out late on the Friday night of a bank holiday. 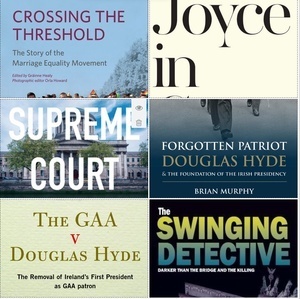 Peruse Derek’s Summer political reads here. Posted in Misc and tagged Derek Mooney, Mooney on Monday at 4:39 pm on August 14, 2017 by Derek Mooney. Oh fupp off. You’re a tabloid rag. Ha. You should tell that to Broadsheet as the site regularly features our work!